Do you really know your dog or cat’s signals? Chances are you’re wrong! Learn to recognize your pet's overall body language which can oftentimes be misread. A purring cat and tail wagging dog are happy campers. Hmm, not so much! Cats purr when they’re happy, but this can also be a sign of apprehension, fright or illness. When dogs wag their tails, they might feel excited, but on the flip side, this can also mean stress. Learn to recognize your pet’s overall body language which can oftentimes be misread and try to minimize their source of anxiety. When dogs lick their wounds, healing occurs more quickly. Well, yes and no. Licking a wound is instinctual for a dog because they can’t care for themselves with salves and disinfectants. Dog saliva contains some beneficial materials that can help promote healing. It contains a protein called tissue factor (also called platelet tissue factor) that can help promote blood clotting. Dog saliva also contains Opiorphin, which acts as a painkiller. Dogs have billions of bacteria inside their mouth, and many can also cause infections. Bacteria that are harmless inside your dog’s mouth such as pasteurella can cause serious infections if introduced into a wound. Surgery sites are especially dangerous when it comes to licking since it can break down sutures and reopen the wound. Prevent your dog from licking their wounds by using an E-collar, a bandage, or distraction techniques. When pets itch, they have fleas. Well, not necessarily! Many pets are itchy because they have an allergy to some substance. 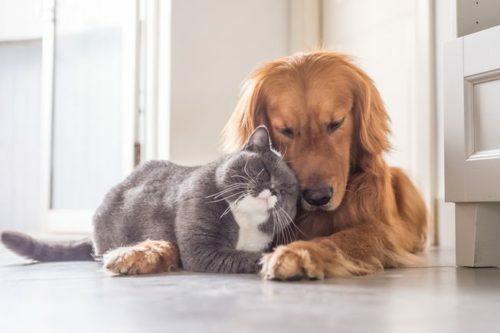 Pets can also itch due to such conditions as pruritis which if left untreated, can result in a “hot spot” which is damaged, oozing, dry skin due to excessive scratching, rubbing or licking. Find out what is causing your pet’s itch, and resolve the issue. Changing your pet’s foods is a bad thing. Not true! Changing up your pet’s food selections can be a good thing, as long as the offerings are nutritious and high-quality. Cats are anti-social. Au contraire! Cats love being around folks; chilling with humans. It is not out of character for a cat to follow you around and try to help you do whatever it is you’re doing. Cats need stimuli and interaction so give them more face-to-whisker time. Keep in mind, your cat does need your interaction. They have independent features, and they don’t have that neediness of a dog, so we tend to forget about them. However, the idea of the loner cat is just folklore. Giving pet supplements is a pain! Says who? Many pet supplements are now available in various forms that are easy for them to ingest such as powders, tasty chewables, or even treats. Many pet owners swear by pill pockets, a nutritious treat for dogs and cats that contain a built-in pocket, perfect for hiding a tablet or capsule. Skipping a flea and tick preventive during the winter is fine. Not! Fleas are feisty suckers and can survive in temps as low as ~33 degrees, and ticks become active in temps above ~40 degrees. Since winter temps, especially in the Northeast, tend to fluctuate, vets agree that dogs should remain on flea and tick (and heartworm) meds year-round. Rubbing your dog’s nose in an accident will put the brakes on this behavior in the future. Wrong! Dog’s tend to understand behavior problems at the time that the behavior occurs. So, when you rub your dog’s nose in an accident, it is very likely that he or she will not make the connection to know what he did. So, you’re punishing a dog that doesn’t know why they are being punished. Your reaction can actually exacerbate the issue and create more potty problems in the future. Instead, try and catch your dog in the act and redirect your pet to their proper potty place.